Today I have a special treat for all of you! 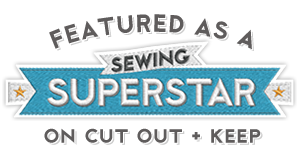 I'm sharing with you a stylish way to organize your sewing studio. They're called Stash Away Fabric Bins, and they are the perfect solution for de-cluttering all that mess that has been accumulating in your studio! 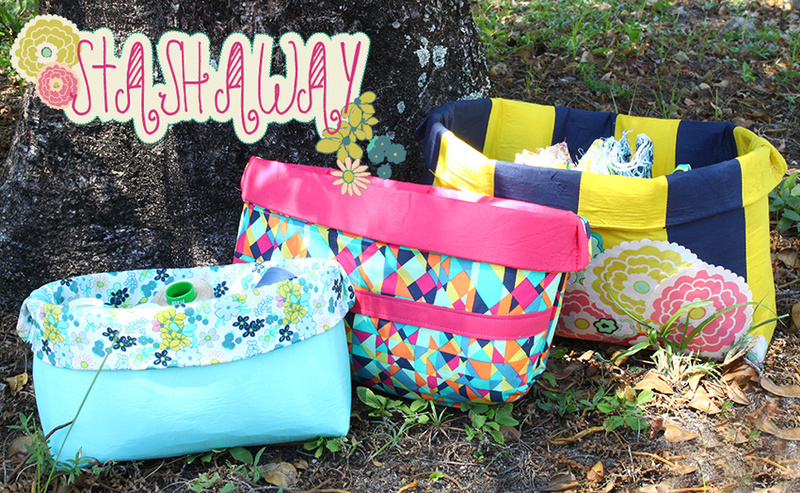 Use them to organize your fabric scraps, misplaced threads, or even use them as your current project bag, where you have all your necessities for your current project in one place. Here is what you need to make the Stash Away Fabric Bins. The approx. finished size of each bin are as follows: Small bin: 12 ½" x 5", Medium bin: 14" x 6" & Large bin: 16 ½" x 8". 7. 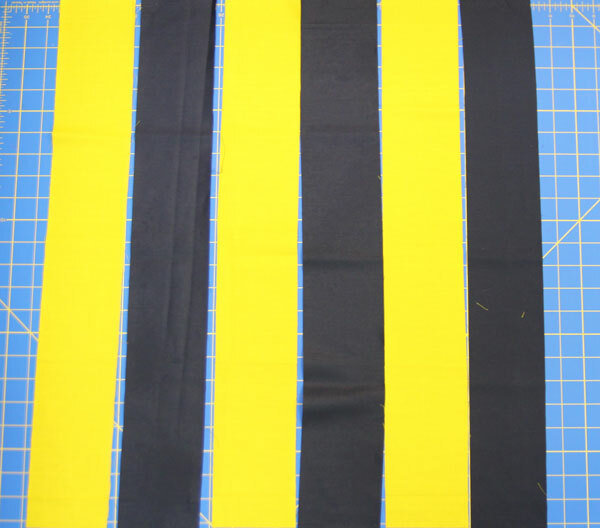 1/2 yard of double stick fusible. 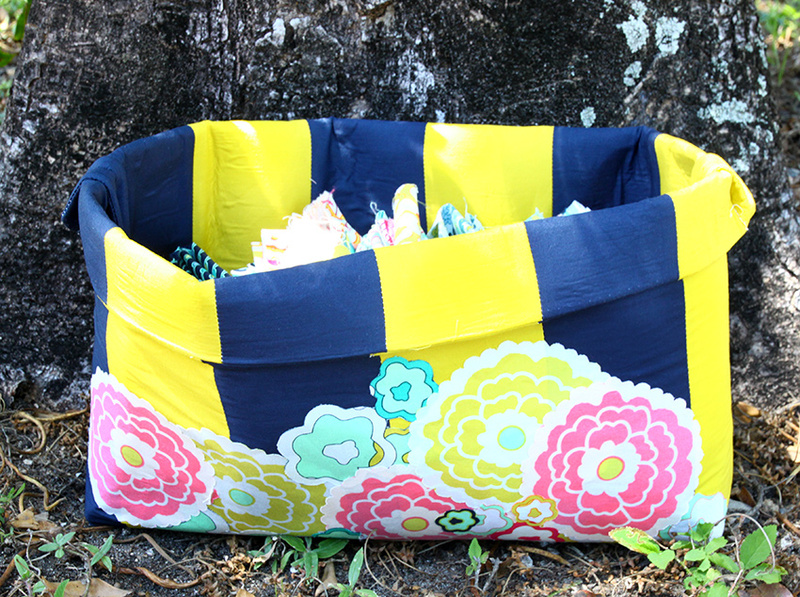 Here are the instructions for this medium sized Stash Away Fabric Bin with flower applique. Make two rectangles of 6 strips each (3 strips of Nocturnal, and 3 strips of Empire Yellow). 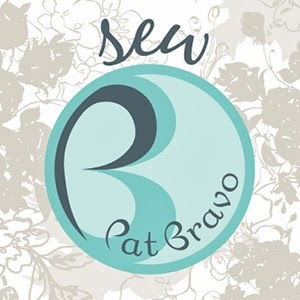 Sew lengthwise with a 1/4" seam allowance alternating colors. You now have 2 rectangles each measuring 18" x 23". One is your lining and the other one is the frontal piece of the bin. 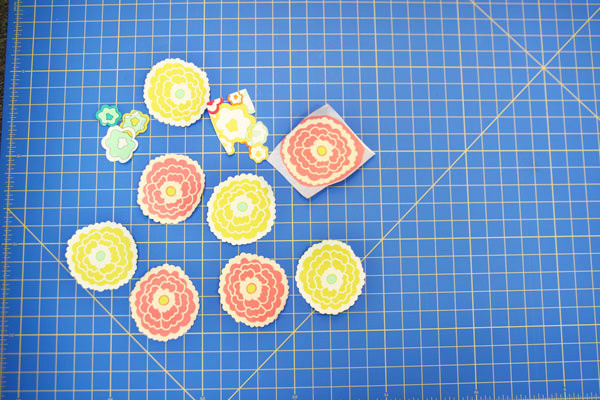 Grab the pieces of Girl About Town Lime, Girl About Town Rose, Psychedelia Gold, Psychedelia Peridot (from my Carnaby St. Collection), and the double stick fusible. 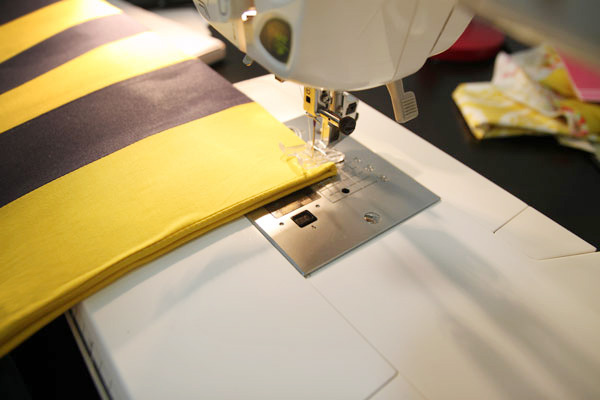 Place the fabric on one of the sides of the fusible and iron it at a low temperature. 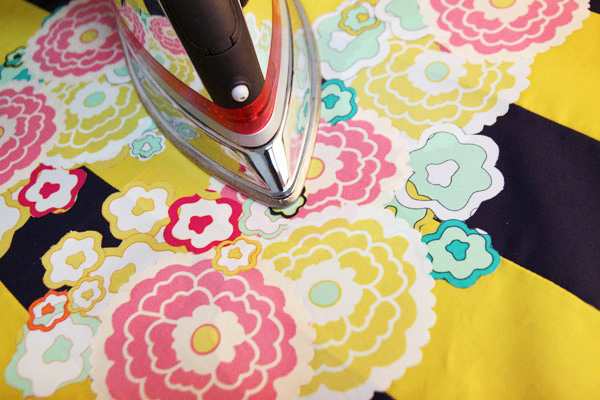 This will stabilize the fabric so that you can cut each flower carefully. Cut through both; fabric and fusible. Layer the lining and the frontal piece of the box face-to-face and pin them on top of the interfacing (the lining should be on top of the interfacing). 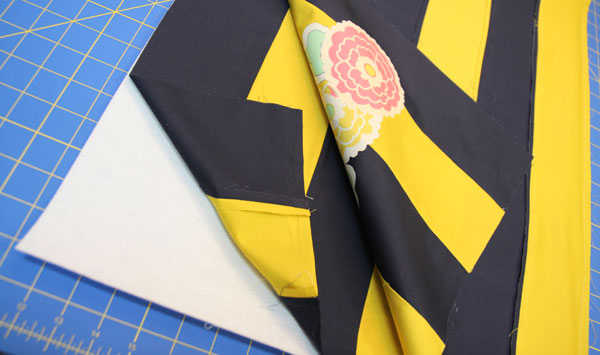 Pin the layers together and sew along the edges with a ¼” seam allowance. 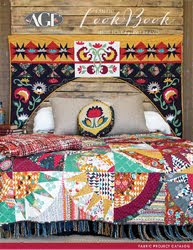 It is very important that you leave an opening of about 4" at the bottom, or enough space to turn the piece inside out. 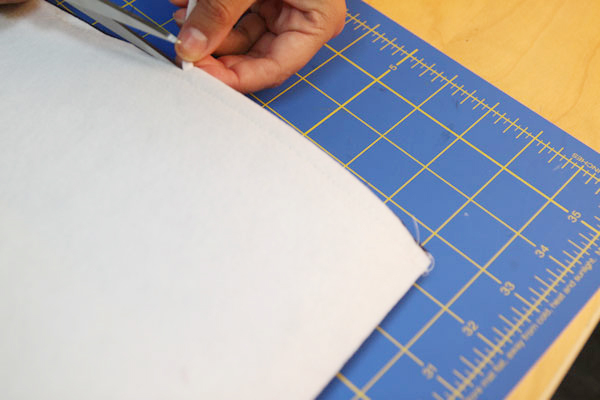 Trim the excess material and turn it inside out. Shape the corners with a small pointed tool. 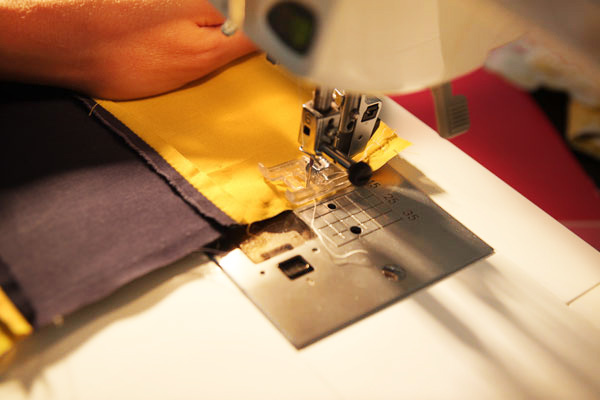 Press heavily, remember to close the opening that you left by hand-sewing it with an invisible stitch. Now it's time to close our box. Fold the rectangle in half by matching each corner (the front of the box should be facing itself). Stitch along each side with a ½” seam allowance and then mark the bottom fold with a pin (this is the base of the bin). 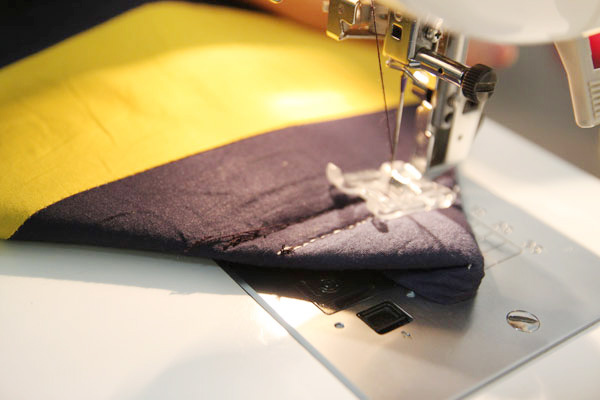 Fold the base and align the side seam with the pin to form a triangle. Stitch across 3” in from the tip and repeat the same step in the other side. The last step is to turn the piece right side out and fold the top edge over. And that's it! See how simple it is! You can make sets of these to give to your friends or various sets of your own and place them in any room that just needs a little touch of style to organization. Love the bins. Thank you for the great tutorial. Could you give the approximate measurements of the finished bins? I'm so glad you love them! Thank you you for this tutorial ! I do something like this a days ago ! Fabulous tutorial. Thank you for shareing it with us. I love making small bags with my leftovers. Now I may have another passion: making small bins with my leftovers! 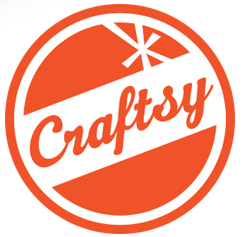 Thank you for sharing your creativity.